On Saturday, the Women’s March took place. It turned out to be a pretty big event. It was always a pretty big deal - but then, I suppose I probably wouldn’t have chosen to go to the London march if I hadn’t thought that. It was my first march. I’ve been fortunate in that I haven’t ever had to march out of a personal necessity in my life. I’ve thought about going on previous marches, admired those who have, but never taken that step. In brutal honesty, the bottom line is that there has always been something else going on on those days, something I wanted to do more: it was never convenient - and never an absolute necessity. To some extent, for me, it still wasn’t yesterday. I’m still well-off: educated, employed, and living in a country with a social security net and public health service - at least, for now. Even if I dislike the result of the #Brexit referendum and think many of the factors behind the result are shady, I still live in a fairly functioning democratic state. But at the same time it has become more and more clear to me over the years exactly how untrue that is for so many others, for the majority of women around the world, and how we’re not exactly making steady progress towards those things for the majority. Slow, unsteady, steps forward are crashing into barriers, and being bounced into lurching tumbles backwards and sideways. Frankly, it was bloody well past time to leave the sofa and the novel behind and go and numb my toes in Grosvenor Square. And it was great. It was fun and it was serious, it was warm (ok, not the weather, that was freezing), and it was hopeful and encouraging but but not under any illusions that it on its own was going to be enough. A few tweets (coughpiersmorgancough) suggest that the existence of the march unnerves some - but not enough, yet, to upset the order of things. When a march comes close to upsetting the order of things, there tend to be arrests. But it was enough to be a start that encouraged more - and that should demand more too. 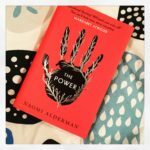 Coincidentally enough, at the beginning of last week, just before the march really began to solidify as a reality in my personal future, I started reading Naomi Alderman’s novel The Power. If you’ve not heard of it, the premise of the book (with as few spoilers as possible) is that women start to develop a skein across their collarbone that generates electricity, giving them the ability to deliver electric shocks. The novel is framed by a couple of letters, which places the writing in a very different future society looking back at what, it becomes clear, is our present. It is a stunning read. Two of my book club friend have accurately summed it up as, ’So HANDMAID’S TALE, but on CRACK.’ We have a dinner booked in for a serious post-THE POWER debrief, because OMG are there ever things that I need to talk about. There were a couple of things that really struck me - and neither of them were the gender-power-imbalanced future that emerges was as undesireable as our gender-power-imbalanced present. That I already knew, thanks. Most feminists do. One was the cumulative build of events: everyone in the book is trying to the best they can to protect and preserve the people and things that they care about and think are good - with varying degrees of recognition and caring of what that might do those outside that sphere of things ‘worth saving.’ Obviously I have certain sympathies within the novel - the novel itself has certain sympathies - but the principle holds across the board. The second was how this cumulation contributes to the growing sense that losing must be held to be impossible. Because the losing side won’t go back to square one, they’ll go back to square minus at least five, people will do things - extreme things - that they might in abstraction choose not to do to other people. Doing something terrible is better - for you - than the consequences of not doing it for you and others. The battle becomes a zero sum not necessarily because it is a zero sum game, but because at least one side insists that it is one. Let’s be clear, The Power definitely has a view on where we’re starting from (a fairly accurate view IMHO), but is also clear-eyed might, might have to and might choose to do, and where it might lead. It would be nice to think we might get from yesterday’s marches to a future where a man can’t boast about sexually harrassing women and then go on to be elected president (amongst other things) without going through a The Power-equivalent scenario, but I’ll be honest, I also think it would be naive. There were plenty of people not at marches talking about the importance of dialogue and the search for unity, and they’re not wrong: but if we’re to avoid The PowerandThe Handmaid’s Tale then the side that wasn’t marching has to get better at the dialogue too. And fast.